Home » Blog » Social Media » What Does a Profitable Social Media Sales Funnel Look Like? Although the exact structure is debatable, digital marketing experts have known these 3 stages to form traditional marketing sales funnels for quite some time. So, does social media fit in at any stage? It’s well-known that users are distracted while browsing social platforms, scrolling through cute baby pictures and cat videos. So, the billions of social media users only amount to brand awareness for the typical small business. What about lead generation conversions and profits? You might wonder if the average small business manages to drive users to their website and make sales from the distracted social environment. I’ve personally shared how I made over $300k, in 3 months, from Instagram. Ezra Firestone also shared his case study of generating over $40k in sales from Pinterest. And, many other marketers generate sales for their brands, every day. In this blog post, you’ll see a clearer picture of social media sales funnels. I’ll share different small business examples, showing how they profit from social media networks. And, you’ll also see answers to the most common questions about this social media strategy. Without further ado, let’s open the kimono….shall we? Is social media mostly about driving cold traffic? Let’s start with the most common assumption, that a social media network is all about generating brand awareness and engaging your prospects. If you post links regularly on your social media accounts, you might even turn off your followers. Social media users don’t care about your website. They are only there to interact and share posts that lay inside the walls of social media. You’ll typically see a much higher bounce rate (single page visits), as compared with your other traffic sources. Social media traffic equates to low engagement and you shouldn’t expect any sales. You’ll only end up making more basic brand awareness across social media networks, right? What can possibly be wrong with this assumption of only getting cold traffic from social? The inherent human nature to simplify. See, digital marketing is essentially getting in front of a customer with a relevant message, at a time when he’s most likely to buy. The typical marketing funnel is just a theoretical model to demonstrate the customer journey that begins with filtering options from many brands. It shows where the consumer eliminates some choices and moves through the digital marketing funnel. And, finally, they choose to buy from one brand. In real life, our experience can be different from our theoretical knowledge. Here’s how Hugh MacLeod demonstrates it. Coming back to sales funnels, here’s how McKinsey explains the decision-making process of the consumer. There isn’t a systematic narrowing down to the most appealing brand. Rather, they seem to decipher the consumer journey as circular. With numerous touch points and product choices, the traditional marketing funnel fails to describe the consumer journey accurately. People form impressions of brands from various touch points, including advertisements, news reports, conversations with family and friends and product experiences. So, does this McKinsey model of sales funnels accurately depict a social media user’s behavior? Not for every type of small business, because the journey isn’t linear. Here’s how social media networks might serve all of the 5 stages of sales funnels. Awareness – Someone likes your business page when their friend (who is your existing follower) shared one of your blog posts. Familiarity – Engaging with your social media updates or commenting on blog posts. Consideration – Tagging you and asking questions about your product during a live Q & A. Purchase – Clicking on your product ads and buy buttons to complete their first purchase. Loyalty – Continuing engagement with your brand on your Twitter handle. Getting any technical issues related to your product fixed, by sending you a message on social media. Kevan Lee shares that Buffer has experimented with numerous variations of a social media strategy that are in the middle and bottom of sales funnels. He feels that social media shouldn’t be counted on to be just ONE specific element in the digital marketing funnel. Rather, he suggests that we view social media as having its spectrum where a user does all the activities ranging from brand awareness to loyalty. For a social media tool like Buffer, it’s no wonder that their target audience hangs out a lot on social media. And, they have had success with generating brand awareness, building their presence and generating sales. Here’s what their social media sales funnel looks like. I hope that this section cleared up some of your doubts about social media being purely an awareness driving medium. Depending on your products and what type of small business you happen to be, the elements in your social media sales funnel will be different. In the next sections, you’ll see specific types of a social media strategy for generating sales. And… he abandoned your website. Then, he never came back. While seeing a surge of unique users in your analytics account might feel great, initially…let’s get real about it. First-time visitors to your website almost never convert (for most small business types). The average documented ecommerce shopping cart abandonment rate is 68.63%. Moz found that it takes seven and a half visits to their website, before a person opts for a free trial of their product. And, these visits are a mix of search, social and direct. If someone converts before these many visits, then Moz frequently doesn’t see the visitor get through the free trial of their product and buy. So, how can you increase the exposure of your brand in front of a customer? It would be great to call your prospects personally and address their objections. But, you don’t have their contact information and other personal details. Once you paste a script in the header of your website, you’ll reappear in front of the visitors that abandoned your website, on social media. You can follow these visitors with a targeted ad and a relevant message, based on their activity on your website. Here’s how a remarketing ad might help ecommerce websites convert the visitors that abandoned their website without checking out. Essentially, you’re trying to leverage the frequency illusion. Every additional ad impression of your product makes a consumer more familiar with your brand and it breeds trust. So, where do remarketing ads fit in your digital marketing funnel: middle of the funnel or bottom of the funnel? As per traditional small business wisdom, you should nurture first-time visitors with great content marketing and value. After they have built a relationship with your brand, then you can ask for the sale. Essentially, you get people on your mailing list. A while back, in this blog post, Michael Kawula, from Social Quant, shared that they are following this content marketing strategy. Drive traffic from Facebook to blog post >> Remarket with an ebook, to those who visited >> Drip series. But, nurturing lead generation might not always be the best option, from the perspective of conversions. Grow and Convert recently shared how even directly asking for a conversion in a social media or blog post might be better (in some cases). Although the argument Deven makes is for content marketing, it also applies well to social media. They have even created a conversion calculator spreadsheet that you can use, for evaluating if lead generation nurturing makes sense for you (you can download it by going to this blog post). Only when you scroll to the bottom, will you see an email subscription box. So, SaaS businesses shouldn’t be afraid to leverage remarketing ads, at the bottom of the digital marketing funnel. Free trials are a great incentive for interested customers. A great SaaS example of a company that has had great success with retargeting ads is Baremetrics. Here are the types of banner ads that they ran. Baremetrics is spending $6 on retargeting ads to acquire a customer on Facebook. And, the worth of this customer is $650. That’s a tremendous ROI that any SaaS would drool over. What if you’re an ecommerce website? Then, you’ve got to directly ask for a sale. Bring a casual visitor back to your website with special discounts. Show targeted message to the visitors that abandoned your product pages. Bring back a customer that abandoned their cart. Cross-sell and upsell to already existing customers with relevant offers. Finally, I want to talk one of my favorite small business types: blogs. Typically, bloggers are individual hustlers that sell consultation services. I’ve had success with query ads that were funny (like the one below). 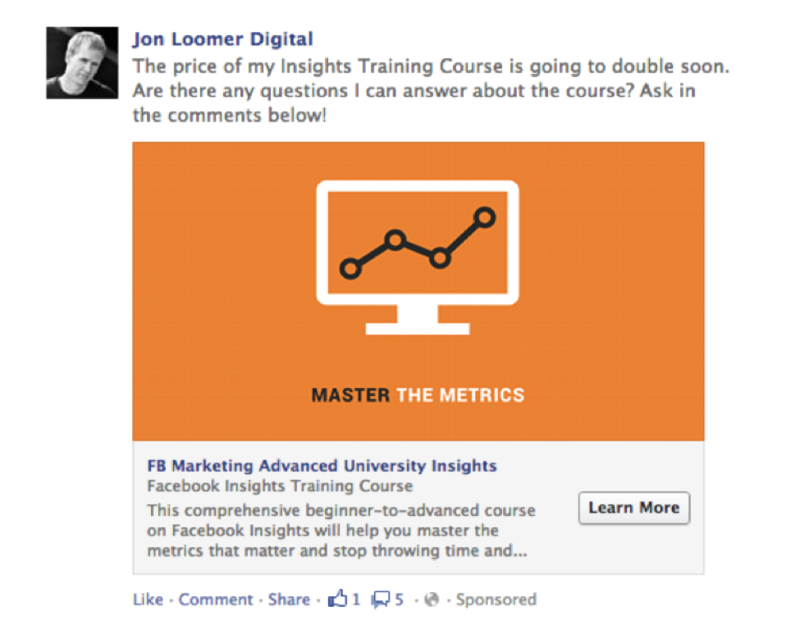 I’ve also improved my deal closing ratio by 28%, with remarketing ads, like the Facebook one below. If you sell an information product, then you’ll need to provide value, before expecting a conversion. You can encourage lead generation by using lead magnets, like eBooks, free reports and email courses in your remarketing ad. But, generally, online courses are sold in conjunction with webinars. So, you can remarket to recent webinar attendees and directly ask for a sale. It’s a compelling retargeting ad to the visitors that have already visited a landing page on his website. The stand-out aspect is that Jon is even answering queries about the course in the comments on the ad itself, thereby increasing engagement with the ad. I hope that the examples I’ve shared have got your creative juices flowing for the next remarketing ad for your business. But, note that if you’re running a small business with a complex value proposition, then you probably won’t see laudable conversions. As much as you’re passionate about creating a thriving small business, you can’t forget the fact that there are real humans on the other side. You don’t have to rely on robotic models and toy with their feelings until they take out their wallets. Your aim should simply be to add value. That’s where the concept of the inverted sales funnel comes in. Mailchimp follows this philosophy. As visible from the diagram, you don’t try to acquire new customers aggressively. Instead, you simply love your existing customers. And, since your customers love you back, they send some of their friends to you. But, you don’t make a fuss about lead generation conversions. In the context of social media networks, this philosophy makes even more sense. When you show more customer love on social, then it’s bound to spread. Instead of thinking from the perspective of making sales, you simply give your existing social media followers the kinds of social media and blog posts that they have liked and engaged with previously. It’s not easy to make your customers happy, every single time. But, trying to evoke positive emotions consistently can eventually create a viral post that tremendously amplifies your brand’s message. So, dig into your social account insights and double down on the types of posts that are already working. The traditional linear maketing funnel doesn’t depict the buyer’s journey on social media. But, you can surely generate conversions from social media. Even on a platform, like Instagram, that doesn’t allow links, Foundr Magazine was able to pull off over 100k opt-ins. They share their Instagram sales funnel in this article. I also showed you a few case studies and variants of digital marketing funnels that other businesses are leveraging in this article. I want to hear from you now. What does your social media sales funnel look like?